SHENZHEN, China, Sept. 10, 2018 /PRNewswire/ -- Vivo has announced plans to spearhead industry development of pre-commercial 5G smartphones through the introduction of ground-breaking 5G software and hardware based on Vivo NEX smartphone series. 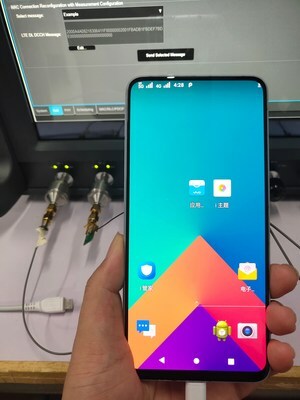 Vivo has completed the initial development of 5G smartphone software and hardware on Vivo NEX. Running on Qualcomm's X50 modem, Vivo has concluded initial architecture planning, 3D placement stacking, RF /antenna designs and optimized battery space within NEX to deliver 5G capabilities . The 5G version of NEX has completed the first phase of protocol and signaling tests with Keysight UXM 5G signaling. As a next step, Vivo's 5G pre-commercial smartphone will enter further IODT tests with 5G infrastructure and networking equipment, as the company continues to work towards its goal of launching its first batch of commercial 5G smartphones by 2019. Vivo's 5G version of NEX supports the Non-standalone Architecture (NSA) model which includes dual connection for both Long-Term Evolution (LTE) and New Radio (NR), based on 3GPP Release 15 standards. "The 5G era will spark abundant and new possibilities for the smartphone industry. The combination of 5G and AI Technologies will turn smartphones into intelligent platforms which will take the industry to new heights. We foresee that with 5G and AI, the smartphone will become the sensory, control and service hub for consumer lives", says Alex Feng, Senior Vivo President of Vivo. Vivo began its research into 5G not long after the International Telecommunications Union (ITU) released the vision of IMT-2020(5G). Vivo set up its 5G Research Institute in Beijing in 2016 and became one of the main contributors at the 3GPP standard group to develop 5G technologies. In the past year, Vivo activated 5G antenna and RF related development to further accelerate Vivo's pace of 5G innovation. Vivo also partnered with China Mobile on the "China Mobile 5G Device Forerunner Initiative" and has been working closely with Qualcomm on 5G developments, including recently the successful design and integration of new 5G mm-Wave (millimeter wave) antenna arrays into a Vivo commercial form factor.